LA JOLLA–(March 6, 2018) If you've ever wondered how strenuous exercise translates into better endurance, researchers at the Salk Institute may have your answer. In a study published in the journal Cell Reports on March 6, 2018, scientists in Ronald Evans' lab have shown that the protein ERRγ (ERR gamma) helps deliver many of the benefits associated with endurance exercise. "ERRγ helps make endurance exercise possible," says Ronald Evans, who is professor and director of the Gene Expression Laboratory and co-senior author on the paper. "It gears up the energy-creating cellular power plants known as mitochondria, creating more blood vessels to bring in oxygen, take away toxins and help repair damage associated with muscle use. This makes ERRγ a really interesting potential therapeutic target for conditions with weakened muscles." The story starts with the PGC1α and PGC1β proteins, which stimulate 20 other proteins associated with skeletal muscle energy and endurance exercise, including one from the Evans lab called ERRγ. In turn, ERRγ, a hormone receptor, acts to turn on genes. The Evans lab researchers wanted to precisely understand ERRγ's role in skeletal muscle energy production and how that impacts physical endurance. To unravel this relationship, the Salk team studied mice without PGC1α/β. 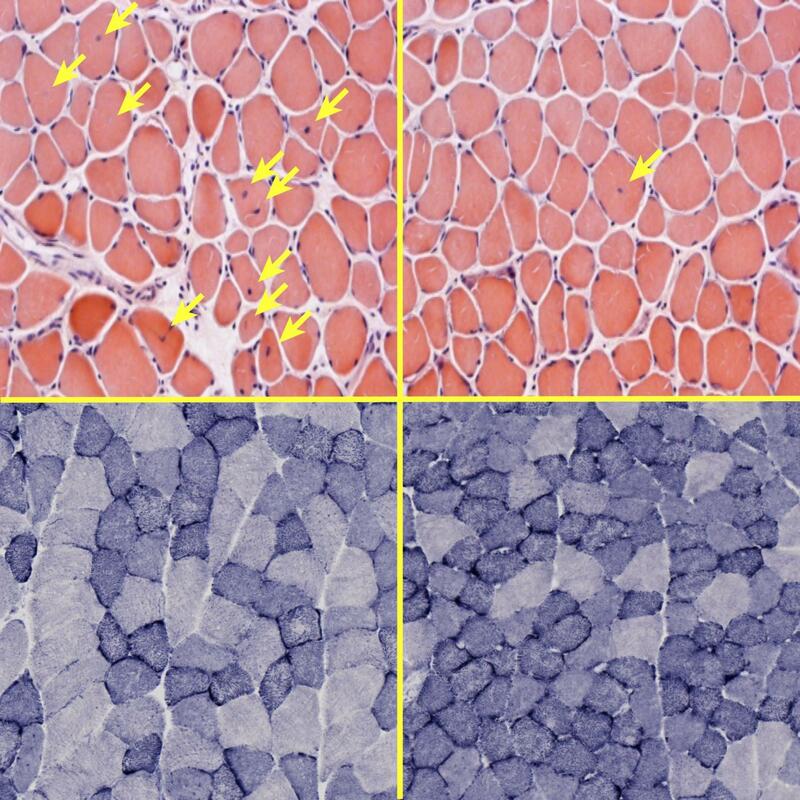 In some, they increased ERRγ selectively in skeletal muscle cells. This approach allowed them to measure how ERRγ and PGC1 act independently, as well as how they function in combination. Losing PGC1 had a negative impact on muscle energy and endurance. However, boosting ERRγ restored function. The team found ERRγ is essential to energy production, activating genes that create more mitochondria. In other words, they found the power switch for skeletal muscles. The lab also showed that increased ERRγ in PGC1-deficient mice boosted their exercise performance. By measuring voluntary wheel running, they found that increasing ERRγ produced a five-fold increase in time spent exercising compared to mice with no PGC1 and normal ERRγ levels. "Now that we have detected this direct target (ERRγ) for exercise-induced changes," says Weiwei Fan, a Salk research associate and the paper's first author, "we could potentially activate ERRγ and create the same changes that are being induced by exercise training." In addition to increasing the number of mitochondria in skeletal muscle cells, ERRγ also increased muscular blood flow. "You have to get more blood supply in to get more energy and take away toxic metabolites," says Michael Downes, a Salk senior scientist and co-senior author on the paper. "ERRγ boosts vascularization as well as mitochondria." But perhaps the most important finding is that ERRγ could be a significant therapeutic target in helping to repair damaged muscles. "Mitochondria play such a central role in cells throughout the body, but particularly in muscle cells, which tend to require more energy," says Evans. "We now know that, by increasing mitochondria energy output, ERRγ can actually rescue damaged muscle. If we can identify small molecules that specifically target ERRγ, we hope to help people with muscular dystrophy and other skeletal muscle conditions." Other authors included Nanhai He, Chun Shi Lin, Zong Wei, Nasun Hah, Wanda Waizenegger, Ming-Xiao He, Ruth T. Yu and Annette R. Atkins at Salk and Christopher Liddle at Sydney Medical School. This study was funded by: the Office of Naval Research (ONR N00014-16-1-3159), National Institutes of Health (DK057978, HL105278, HL088093, ES010337 and CA014195), National Institute of Environmental Health Sciences (P42ES010337), Department of the Navy, Office of Naval Research (N00014-16-1-3159), the National Health and Medical Research Council of Australia (512354 and 632886), The Leona M. and Harry B. Helmsley Charitable Trust (#2017PG-MED001), the Samuel Waxman Cancer Research Foundation, Ipsen/Biomeasure and the Glenn Foundation for Medical Research.